Heavy gauge, all steel, double wall construction supports heavy loads. Includes tubular locks for greater security. 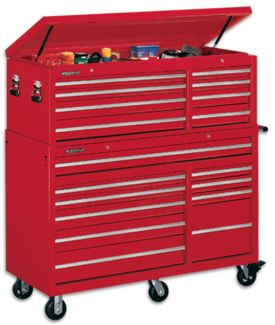 The extra deep chest provides added drawer capacity, 3 – 4" of more storage space than average chests. 2 gas lifts raise the lid when top is unlocked to expose the large till area for larger tools – 2-13/32” deep. 4 large heavy duty carry handles with rubber grips for a two person lift for placement. Available in red, epoxy powder coat paint finish.